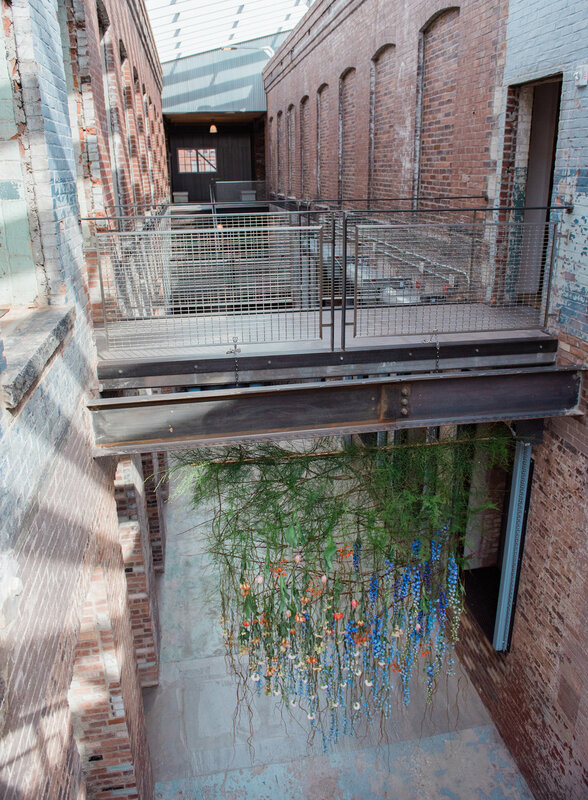 Mass MoCA is a spectacular museum and a fantastic choice of venue for your wedding or other event if you are an artist or art lover, a bit edgy or want an unusual non-traditional wedding. I was over-the-moon to have the opportunity to do a styled photo shoot there. I adore this place! I’ve been asked so many times over the years “How did you come up with that?”, and all I really had to offer was an unsatisfying shrug. As my first blog post, I thought I would use this shoot to really think about and deconstruct it to find out how I got there. Possibly TMI, but here goes. My initial thought was to make a floral installation piece in tandem with the hanging sculpture The Couple by Louise Bourgeois. It would make an excellent spot for a wedding ceremony but was off limits to us for copyright reasons. It’s totally allowed for an actual wedding though–call me! I’m an architecture junkie, so my concept was to work with the structure and characteristics of the building and install florals that felt integral and would be worthy of the majestic space and reputation of the venue. I also wanted to make it an intimate wedding, even though the space is so vast and open. 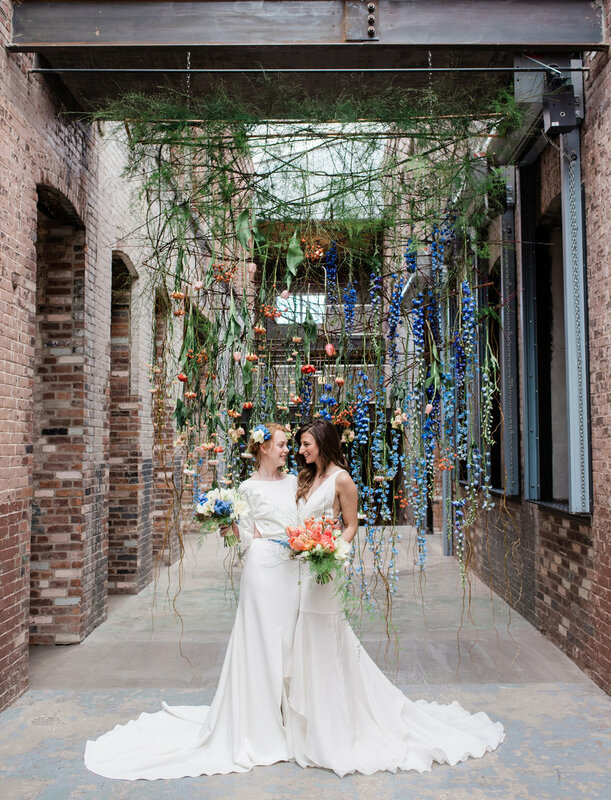 For the ceremony site, I chose the fully skylit connector space between galleries, using one of the overhead walkways to hang a floral curtain for a focused backdrop. Another issue I wanted to explore was what to do when two brides have different color palettes and still create a cohesive design. I decided to work off of the inherent colors and textures of the building’s industrial interior to set my palette. Kimberly from Everthine Bridal selected two understated, clean-lined gowns that would not compete with the textures of the building and florals. From the pale pink, peach and rust of the remnant paint on the old brick, I chose to ratchet up the hue and go with a strong orange, melon and coral. 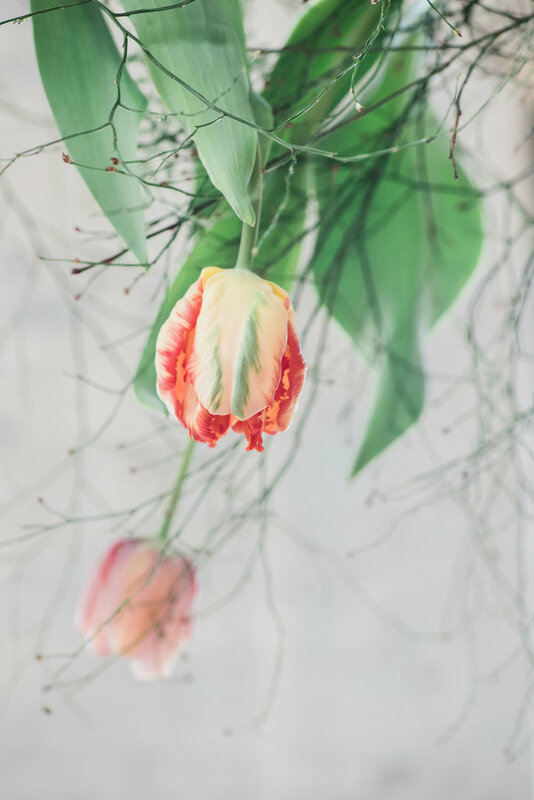 The gorgeous locally grown French and parrot tulips and poppies provided the perfect colors, and brought the season inside for this spring shoot. Blue tones from old floor paint and new steel accents brought us to a range of cool blues with the softest yellow-cream for our second bride. Spring flowering muscari and delphinium helped out. We used the industrial seating available at Mass MoCA throughout; the galvanized Xavier Pauchard designed Tolix cafe chairs for the ceremony, and the science lab stools at the custom-made 25 foot long live-edge oak table on wheels (below). For the reception, we fabricated tall copper structures for the tabletop to add height and bring intimacy. Lounging tulips and poofs of bright green sweet huck tied in with the upholstered furniture that lives in The Prow of Building 6. Tabletop sourced and styled by Evelyn of Let’s Make Magic Events. I love to make special personal flowers for brides. Here, floral hairpieces for both, and a sweet belt of delphinium petals to pop from the clean-lined gown. Rounding things out to complete our shoot: Above: Maddie of Sugarhouse Stationery brought a sharp industrial look with copper foil accents to the otherwise black and white stationery suite. Left: Abbi of A to Z Cakes picked up the hues of the walls perfectly in her funky art cake.